No, this is not my latest listing in Pinecrest. 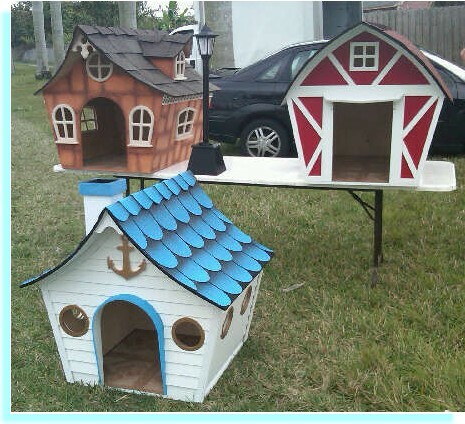 This is one of the cutest dog houses I’ve ever seen! I was driving west on 152nd Street and had to do a 180 so I could appreciate these little homes closer. They impressed me to no end. 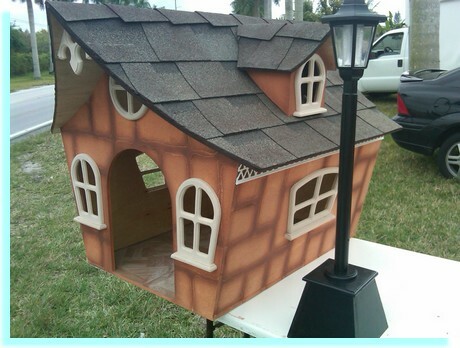 The luxury dog houses are created by Ricardo and Janeth. He is a master carpenter who specializes in custom yacht carpentry. As the luxury market had dwindled a bit, so did the amenities associated with it. In a moment of inspiration they decided to make custom homes for our furry friends. My precious Fifi and Lola would love to live in any one of these homes. There’s the little red shingled barn, a boat house with its crisp white paint, chimney stack and shiny golden anchor (look at those porthole windows! ), and the stone villa, with its textured walls, and windowed gable. Sooooo cute! The attention to detail in these homes is impressive. To order your own custom home for your furry best friend, you can contact Ricardo or Janeth at 786.285.9431 and tell them Maggie sent you. This entry was posted on Sunday, March 28th, 2010 at 6:47 pm	and is filed under Local Resources, South Florida Living. You can follow any responses to this entry through the RSS 2.0 feed. Both comments and pings are currently closed.